Portland, Ore. (January 14, 2014) Pear Bureau Northwest is pleased to introduce a new display contest that is open to retailers of all sizes in the U.S. and Canada in February and March. The “Pear Up with USA Pears” Display Contest invites retailers to build an eye-catching display that features Green Anjou, Red Anjou, and Bosc pears at minimum, and inclusion of other varieties of USA Pears is encouraged. To qualify for the contest, the display should be maintained for at least one week during the February – March timeframe. To take advantage of the bounty of extra large size USA Pears that are available this season, this contest offers bonus points for retailers whose display includes jumbo pears size 70 and larger. Entrants are asked to submit an entry form with at least one photo of their display by the deadline of April 15, 2014. Entries will be judged on a 100 point scale for appearance, creativity, and educational impact. Ten bonus points will be added to entries that include any jumbo size pears. As recognition for their participation, all who enter a complete and eligible entry will receive a gift card for Amazon.com valued at $20. This categorization allows stores of all sizes to participate and compete for top prizes, with a total prize value of $11,250. A “Pear Up with USA Pears POS Pack” is available to retailers for use in their displays. It includes several 7″ x 11″ point of sale cards, recipe tear-off pads, and brochures for distribution to shoppers. Retailers can simply call the Pear Bureau at 503-652-9720 or fill out an online form at www.usapears.org/displaycontest.aspx to request a free POS Pack. Use of some or all of the materials in the POS Pack is optional for participating in this contest. 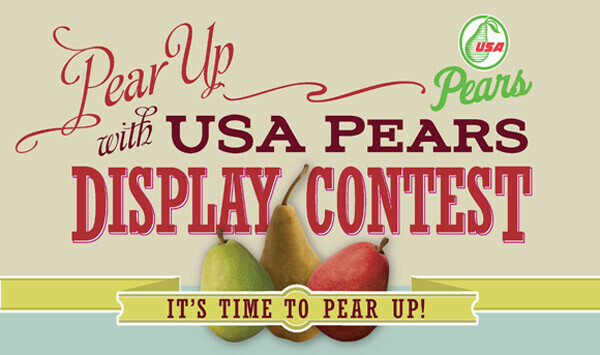 For complete rules, promotional flyers, and entry form, visit www.usapears.org/displaycontest.aspx.